Looks who's up on top of our WLS Chart THIS week!!! Disco was still running rampant here in Chicago ... Andy Gibb's first chart hit (and next week's #1 record), "I Just Want To Be Your Everything" was the #2 record this week ... and the once "bubblicious" Bay City Rollers incorporated a little disco into THEIR sound for this week's #3 smash, "You Made Me Believe In Magic", another one of those songs that absolutely deserves a spin now and then. Quite a few remakes on the chart this week, too ... Rita Coolidge's version of the Jackie Wilson classic "Higher And Higher" was in at #5, Shaun Cassidy's rocker "Da Doo Ron Ron" (which spent four weeks at #1 before Alan O'Day matched that feat) was now the #6 record in town, "You're My World", the old Cilla Black torch song was now a #16 Hit for Helen Reddy and James Taylor's slowed down version of the Jimmy Jones Hit "Handy Man" was in at #27. Brand new music on the chart this week included the now over-played "Smoke From A Distant Fire" by The Sanford-Townsend Band and the long-since-forgotten "Slide" by Slave. One of my personal favorite pop songs of the '70's, "Ariel" by Dean Friedman (also a sometimes Forgotten Hits Contributor), was climbing the chart at #11 this week (on its way to a #4 peak a couple of weeks later) and the annoying novelty hit "Telephone Man" by Meri Wilson jumped from #37 to #30 this week. Another Forgotten Hit is this week's #10 Record, "Angel In Your Arms" by Hot ... we're going to suggest that some of the deejays on the list feature THIS one sometime this week, along with the previously mentioned Bay City Rollers track. And with those words, we had officially landed a man on the moon. In 1961, President Kennedy had challenged us as a nation to make this happen before the end of the decade ... and, in 1969, we did. Incredibly, when Kennedy first extended his challenge back in 1961, the nation's entire manned space experience consisted of only 15 minutes and 20 seconds, which was the length of Alan Shepard's maiden voyage on May 5, 1961. In fact, virtually NONE of the equipment capable of making the journey to the moon even existed yet back in '61 ... but over the next eight years, The United States assembled a team of over 400,000 men and women at 120 universities and 20,000 industrial firms to develop the technology (and the fifteen million parts) necessary to make such a half-million-mile road trip. Our track record up to that point wasn't very impressive ... joining "The Space Race" in 1957, after The Soviet Union launched Sputnik, The U.S. saw thirteen straight failures between 1958 and 1964 while trying to accomplish a successful "lift off" from the Cape Canaveral Launch Pad, headed toward the moon. And the flight of Apollo 11 didn't exactly go off without a hitch either! Before Armstrong announced "The Eagle Has Landed", the crew experienced a few "tense" moments when, just 160 feet away from the moon's surface, an alarm went off signaling that only 114 seconds worth of fuel remained aboard the lunar module, leaving the crew 40 seconds to decide if, in fact, they could land within the next TWENTY seconds!!! Apparently some communication interference between the command module, the "mother ship" Columbia and The Eagle caused a false reading that potentially could have driven the crew into an area occupied with lunar boulders ... or have forced them to reach the decision to abort the mission entirely. Ultimately, Mission Control simply turned off the radar to remedy this situation and, as we now all know, The Eagle landed safely. Incredibly, we learned on the recent anniversary of the moon landing that much of the original video filmed by NASA had been erased over the years ... the scramble was soon on to collect and clean up video from a variety of other sources in order to recapture the complete event for all posterity. 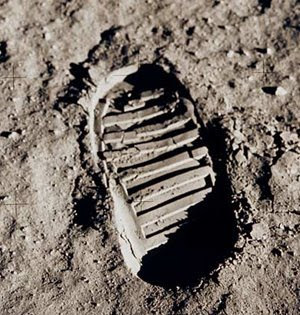 Incredibly, it is entirely possible that the footprint shown above, imprinted by Astronaut Buzz Aldrin on July 20, 1969, on the moon's surface, may remain entirely intact some 40 years later. That's because the moon has no atmosphere and no winds ... so speculation is that, unless it was in some fashion disrupted by one of the countless meteorites that collide with the moon each year, it very likely remains EXACTLY where he left it, looking virtually identical to the photo shown above! Amazing! 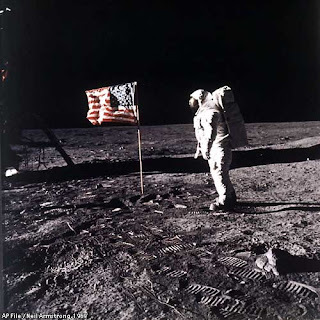 Likewise, because there is no wind on the moon, The American Flag planted there had to be rigged with a support bar to keep The Red, White and Blue unfurled ... the 3 foot by 5 foot flag was stiffened with a thin wire so that it would appear to always be waving in the vacuum of the moon's non-atmospheric state! As they say, if you remember it, you weren't there. I guess there was some faked moon landing and a concert we didn't even hear about until the next year. And Mary Jo Kopechne got driven off the Chappaquiddick Bridge (there's a song there, Bobbie, I tell ya). The Summer of 1969 in Chicago was genuinely magical for me. 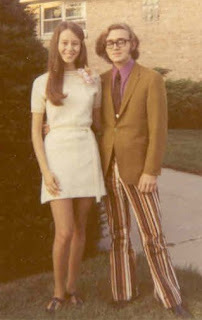 I had just turned 17, the very geeky president of the Lane Tech High School Astronomical Society. As far as I was concerned, Apollo 11 was the greatest triumph humanity had ever experienced, and I was constantly down in the basement, tinkering my home-made telescope, fooling with electronics, and wondering why girls ran screaming from me. My grubby AM radio was always on, no matter where I was, to either WCFL or WLS. (I was still too poor to afford FM.) Most people remember songs like "Sweet Caroline," "Crimson and Clover," or "Hot Fun in the Summertime," but there were lots of other odd cuts that got some play here and there, especially on the 9-noon slots. One of my favorites was "Abergavenny" by Shannon, a rousing novelty beer-hall march about taking a hike up to a small town in Wales. Shannon included Peter Knight, who went on to join Steeleye Span in 1970. Got to say hello, it's a lucky day! Kiss the moon goodbye and be on my way! It's a lucky day 'cause I found you! Gonna build a new world around you! Touch the sun and run, it's a lucky day! I was dumbfounded when I learned that her favorite band was ... The Association. "Goodbye Columbus" became our song. I married her in 1976, and forty years later, we are still together, never happier. July 31, 1969: Days don't get any luckier than that! "Goodbye Columbus" was a GREAT book that didn't translate very well to the silver screen ... that's a shame, too, because both Richard Benjamin and Ali McGraw were pretty much at their peaks right around this time. Not a bad tune, though, so we'll feature this one today ... let's face it, you're not likely to hear it on the radio anytime soon!!! Fantastic. It was a pivotal year for a lot of my friends in my age-cohort. We were old enough to start exploring the world beyond our parents' houses, and still too young to start worrying about Vietnam. The Peter Knight connection is key to the success of "Abergavenny." He arranged the orchestration on the instrumental accompaniment, which is amazingly complex if you tune out the voice and pay attention to the instruments. I remember seeing an article on The Beatles in TV Guide in mid-April, 1969. 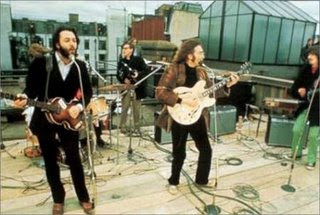 It showed the group performing on a London rooftop and stated that there would be a forthcoming TV special on The Beatles. Then, a few weeks later, Get Back was released, only to be followed a month later by The Ballad Of John & Yoko. There was also talk of a new Beatles album coming out. 1969 was shaping up to be a great year for Beatles fans. Then my other passion was pushed to the forefront. Apollo X had gone into lunar orbit and two astronauts in the LEM had all but landed on the moon. An actual landing was scheduled for Apollo XI. I was at Camp Zakelo that July and anxiously awaited the flight. I saw the lift off on the camp TV in the lounge and asked to be allowed to see the landing that Sunday night. I also wanted to stay up late for the entire walk on the moon. The camp director was reluctant to allow me to do so as he was concerned that other campers would make the same request. I persuaded him to let me watch the whole thing by promising to write an article on the lunar landing for the camp newspaper. He agreed and a few days later I had published my first newspaper article of significance. I still have that issue of the camp newspaper, which was called the Zakolog. Camp Zakelo was in Harrison, Maine. To keep up with world events, I subscribed to the Boston Globe morning newspaper. I remember reading about the moon landing and Woodstock in the Boston Globe. I wondered what it must have been like to walk on the moon and to attend Woodstock. What an incredible summer! That fall Abbey Road was released. I’ll never forget my surprise the first time I played side one on my record player and heard the surprise sudden ending on I Want You (She’s So Heavy). I remember looking around my room to see what happened to make the music stop! And the surprise appearance of Her Majesty as the end of side two! Just as I was about to life the tone arm, that little tune came out of the speakers! It was so cool. There were a lot of other great moments that year, but for me, The Beatles and the space program were the highlights. After a year of COMPLETE European Pandemonium, Worldwide Beatlemania reached its peak in 1964, ushering in the era forever known as The British Invasion ... sales records and television ratings were routinely shattered with each and every new release and appearance. By 1965, besides a string of nearly 40 U.S. Hits, The Beatles already had two feature films under their belts ... a year later, they would quit touring forever, resigning themselves to the studio where each new release became more sophisticated and involved. In 1967, they had recorded their landmark LP, "Sgt. Pepper's Lonely Hearts Club Band', still considered by many to be their crowning achievement ... the recording that forever changed the criteria for making albums. Their appearance on the "Our World" satellite special (where they world-premiered their new single "All You Need Of Love") was, without question, the apex of that night's performances. They followed that with their first real disaster ... their "Magical Mystery Tour" television special was universally panned by critics in The U.K. ... so much so that it wasn't even shown here in The United States for many, many years. In 1968 they spent weeks on end in India, studying transcendental meditation with The Maharishi Yogi and writing songs for what would ultimately become known as The White Album. They also started their own record company, Apple Records, and released the biggest single of their career, "Hey Jude", which topped The U.S. Charts for nine straight weeks. But behind the scenes, they were also slowly beginning to come apart at the seams. The band's two real leaders and songwriters, John Lennon and Paul McCartney, suddenly had new distractions in their lives ... each had found the love of their life and, early in 1969, John would marry Yoko Ono and Paul would marry Linda Eastman. Both were VERY strong women who greatly influenced (some might even say dominated) the lives of their men. The year began auspiciously enough ... The Beatles were not only going into the studio to make a new album, but they were also going to film these activities for theatrical release. Literally hundreds and hundreds of hours of film footage was made, showing the good, the bad and the ugly sides of the band and each of its members. We saw them rehearsing their new material and warming up with songs that they probably hadn't performed since their Hamburg / Cavern days. At various times between 1968 and 1969, each of them had quit the band, feeling that they no longer fit in with the other three. Yoko's presence in the studio only resulted in cramping their style even further ... and soon old pal Billy Preston was asked to join the sessions in the hopes that everyone else would stay on their best behavior with an old friend in the studio. What started out as the "Get Back" album ... and eventually became the "Let It Be" album a year and a half later ... was an effort to "get back" to where THEY once belonged ... just the four of them in the studio without all the fancy strings and overdubs and special effects that had made their recent albums like "Revolver" and "Pepper" so distinctive. A return to their roots, if you will ... to the raw sound that first captured our hearts all those years ago. In concept, it sounded interesting ... in reality, they were already bored with each other ... and no amount of trying to rally the troops was going to change that. 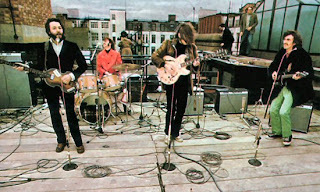 On January 30th, The Beatles gave whole new meaning to the musical phrase "Up On The Roof" when they moved their equipment to the rooftop of the Apple Records Studios and played ... for the very last time ... live music as a four-piece band (five counting Billy Preston on keyboards) for a live audience (albeit passers-by on the street down below.) Paul McCartney recently revisited this idea when he performed on top of the marquee of The Ed Sullivan Theater in New York City on The David Letterman Show. His first song that day??? Why "Get Back" of course!!! When all was said and done, all these hours of toiling in the studio were shelved, left to be sorted out later by anyone with any interest in doing so ... by this point, The Beatles themselves couldn't have cared less. In fact, it seemed all but over. John was on his honeymoon / bed-in for peace and would soon release a solo record, "Give Peace A Chance", recorded in his Montreal Hotel Room as The Plastic Ono Band. Even a mid-summer single, "The Ballad Of John And Yoko" which, although a great rocker, amounted to little more than a newsreel recounting of what the newlywed couple had been up to lately. Incredibly, it only John and Paul were featured on the record ... George and Ringo weren't even invited to the studio that day. John wanted an immediate release (yes, it pays to own your own record company) but the record was banned on as many stations as it was played, and, as such, only managed a #8 showing on the charts. The previously mentioned "Get Back" ... to MY ears one of their weakest outings ever ... topped the charts for five weeks the month before and remains one of their biggest recordings ever. (Shows you what I know!!!) A few of us first caught wind of this song ... and the "new look" associated with the band ... when a film clip from that rooftop concert was aired on The Glen Campbell Good Time Hour in April of '69. The actual film "Let It Be" wouldn't hit theaters until a year later, by which time Phil Spector had been brought in to clean up the tracks. Paul was so unhappy with Spector's work that he pushed to have the "naked" version of the LP released for the next thirty years. It finally was in 2003. So, in recapping 1969, it was the beginning of the end ... quite honestly, their final chapter. ALL of their final tracks were laid down this year ... 31 in all (besting The White Album by one, but falling seven songs short of their 1968 total output thanks to the singles Lady Madonna / The Inner Light and Hey Jude / Revolution and the soundtrack music included on "Yellow Submarine".) The music contained in the albums "Let It Be" and "Abbey Road" have been with us for 40 years now ... and sound every bit as fresh today as they did when they were first recorded. Tracks like "Come Together", "Something", "Here Comes The Sun", "Let It Be", "The Long And Winding Road", "Get Back" and "Across The Universe" are considered nothing short of rock classics today. With the entire Beatles Catalog being remastered and re-released next month, generations to come will continue to discover this great music that so shaped our lives back then. Friday, August 7th: Uncasville, CT.
Philadelphia's First Rock 'n' Roll Star, CHARLIE GRACIE, joins forces with several legendary peers: THE CADILLACS, THE COMETS, LESLEY GORE, JOEY DEE, SAM THE SHAM AND THE PHARAOHS, LOU CHRISTIE, WANDA JACKSON and JOHNNY FARINA (Santo & Johnny) in BOWZER'S TRIBUTE TO ROCK' N' ROLL CONCERT with the STING RAYS. 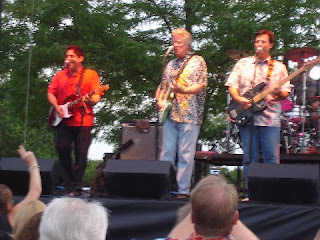 We had the pleasure of catching Dean Torrence and The Surf City All-Stars last Tuesday Night at an outdoor concert gig right here in Elk Grove Village, Illinois. If the band got off to a bit of a rocky start (as suggested by some of the folks we've talked to since), they recovered beautifully and, in fact, seemed to get stronger and stronger as the night wore on. We singled out Philip Bardowell, who absolutely KILLED that night on his rendition of The Beach Boys' classic "Darlin'" ... Frannie even made it a point to tell him (on our way back to the car) not only what a great job he had done, but that Carl Wilson would have been proud. He really seemed to appreciate that! They gave 110%; each song was true to the original recording (Gary Griffin told me some are actually in a higher key than normal - I had assumed they'd be lowered to help the guys on falsetto!). They had the crowd on their feet for most of the night. And Philip Bardowell's lead on Darlin' would have made Carl proud! Hi Kent - I was at the merchandise table off to the right of the stage. I am the drummer. Sorry we missed each other. Please put a great review on your website. 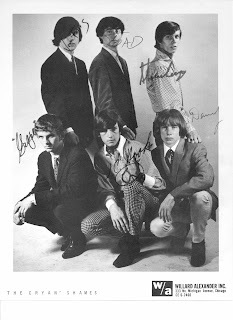 That was Philip Bardowell who played with me, Matt, Gary, and Chris in the Beach Boys. We are off to Ft. Worth, TX to do a date featuring us, Dean, plus Al Jardine & David Marks. Thanks so much, Kent. You were at the show last night? It would have been good to say hello. Did you talk to Dean or any of the other guys in the band? Thank you again, and I'm glad you enjoyed it. 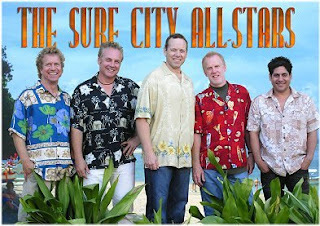 LAST NIGHT MY FAMILY AND I VENTURED OUT TO ELK GROVE VILLAGE, ILLINOIS, NEAR O'HARE AIRPORT IN CHICAGO, TO SEE DEAN TORRANCE AND THIS YEAR'S VERSION OF THE SURF CITY ALLSTARS. THE LAST TIME DEAN WAS IN THE CHICAGO AREA FOR A FREE CONCERT WAS 3 YEARS AGO. THAT CONCERT AND MANY OTHERS WAS CHRONICLED IN THE BOOK "WHEN WE GET TO SURF CITY" WRITTEN BY BOB GREENE. THE BOOK PRETTY MUCH TELLS THE STORY OF BOB GREENE TOURING AROUND THE COUNTRY SINGING AND BEFRIENDING DEAN TORRANCE AND HIS BACKUP GROUP THE SURF CITY ALL STARS. I WAS LUCKY ENOUGH TO HAVE BEEN THERE THAT NIGHT AND I HAD PROMISED THE FAMILY IF HE EVER GOT BACK TO THE WINDY CITY WE WOULD GO AGAIN. SO OFF WE WENT, LAWN CHAIRS IN HAND, AND GOT THERE AN HOUR AND A HALF EARLY. WE PLACED OUR CHAIRS IN THE 4TH ROW STAGE CENTER AND WATCHED THE GROUP MINUS DEAN RUN THROUGH SOME SOUND CHECKS DOING THE LITTLE OLD LADY FROM PASADENA. IT GOT ME IN THE MOOD FOR WHAT FOLLOWED, A 2 HOURS TRIP DOWN MEMORY LANE THAT MADE ME FEEL LIKE IT WAS THE MID 60S AGAIN. TO BE SURE MR TORRANCE CAN STILL SING PRETTY GOOD BUT LIKE ALL OF US HE'S NOT QUITE THE SAME AS WE WERE WAY BACK WHEN. THIS YEAR'S VERSION OF THE SURF CITY ALLSTARS MORE THAN MADE UP FOR ANY OF THAT AND DEAN CERTAINLY HASN'T LOST HIS ABILITY TO ENTERTAIN AND HOST AND MAKE THE AUDIENCE FEEL RIGHT AT HOME. OF COURSE IT DIDNT HURT THAT AT THE BEGINNING OF THE SHOW FIVE YOUNG LADIES THREW BEACH BALLS IN THE AUDIENCE AND ONE OF THEM FOUND THEIR WAY INTO MY 15 YEAR OLD DAUGHTER'S ARMS. THE CROWD WAS TERRIFIC, MAYBE 1500 PEOPLE AT THIS FREE EVENT. THEY HAD LEFT AN AREA IN FRONT OF THE STAGE OPEN AND BEFORE LONG THE CROWD WAS BEING INVITED TO COME UP AND DANCE AND LOOKING AROUND I ACTUALLY FELT I WAS AT A LARGER VERSION OF HUGYFEST LOL. DRAG CITY, THE LITTLE OLD LADY FROM PASADENA, SIDEWALK SURFIN, THE NEW GIRL IN SCHOOL, SURF CITY, LINDA AND, OF COURSE, DEAD MANS CURVE. THE BACK UP BAND INCLUDED SOME TERRIFIC VOICES INCLUDING MATT JARDINE, THE SON OF BEACH BOY AL JARDINE AND THEY WERE ABLE TO RECREATE THE SOUND OF THE BEACH BOYS WITH CLASSICS LIKE DO IT AGAIN, DARLIN, GOD ONLY KNOWS, GOOD VIBRATIONS, WOULDN'T IT BE NICE, SLOOP JOHN B, LITTLE DUECE COUPE, SURFIN SAFARI, SURFIN USA, 409, KOKOMO, DON'T WORRY BABY, IN MY ROOM, SURFER GIRL, HELP ME RHONDA, CALIFORNIA GIRLS, DANCE DANCE DANCE, DO YOU WANNA DANCE AND LITTLE HONDA (FEATURING BOB GREENE ON LEAD). THEY THREW IN A FEW MORE POP MUSIC CLASSICS LIKE LET'S DANCE AND MARGARITAVILLE AND THEN CLOSED THE SHOW WITH THE HELP OF THE SHADOWS OF KNIGHT COMING ONSTAGE TO HELP SING FUN FUN FUN AND BARBARA ANN, A BEACH BOYS CLASSIC THAT, BY THE WAY, DEAN TORRANCE SANG LEAD ON. WHAT A WONDERFUL WAY TO SPEND A SUMMER NIGHT. THE WEATHER WAS PERFECT AND A GOOD TIME WAS HAD BY ALL. IF ANY IF YOU EVER GET THE CHANCE TO SEE THIS SMALL SLICE OF 60S AMERICANA, DONT PASS IT UP. 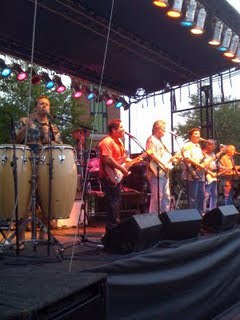 Here are The Surf City All-Stars (with Al Jardine) doing their version of The Beach Boys' Classic "California Girls"! 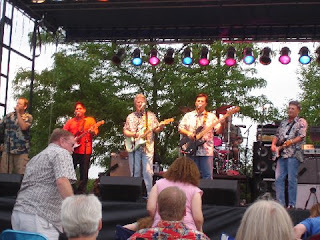 Thanks for that cool review of the Jan & Dean show with the Allstars. We had a great time. Thanks also for mentioning the LEGENDS OF SURF MUSIC line up. I am trying to promote them as much as possible. I am now in Atlanta to perform with David Marks at a club called Mike's Attic. We will have to meet next time I am in the area. Brian Wilson has released a new single, What Love Can Do - Sounds like a good song and a strong Brian Wilson production. Very best wishes to you and all your readers. Attached is a picture of the actual Vox 12 string as heard on the Peter and Gordon recording of World Without Love. 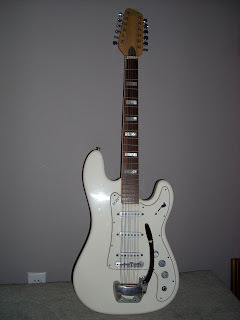 There's not many of these guitars about. Thought Larry might be interested, or maybe some of your readers. I couldn't help but wonder about this very first Peter and Gordon session. I mean, let's face it ... they were virtual unknowns at the time ... who went into the studio for the very first time and cut an International #1 Record!!! I asked Vic to tell us a little bit about that session ... and the early days of Peter and Gordon. FORGOTTEN HITS: Did you typically know in advance whose sessions you'd be playing on when you got the call to be at the studio? VIC FLICK: Very seldom. Usually it was can you do 10 a.m. to 1 p.m. at EMI, electric and banjo - or similar. We always had a trunk full of guitars and pedals etc. to be ready for anything. FH: Peter and Gordon were really a brand new, start-up act at that point ... had you had any prior knowledge of these guys or their musical style? VF: No idea at all what the session was for until I arrived. Always remember Peter and Gordon as two real nice guys who worked hard at what they did. FH: Who made the decision to use the 12-string guitar on the "A World Without Love" session? Was there a particular sound they were going for on this record ... or was that something that YOU might have some input towards? And, if so, how would you even know to have a 12-string at that particular session? VF: The electric 12 string had come into fashion - and then disappeared like the Sitar after a few months - and I was specifically asked for the electric version as opposed to the acoustic. No input other than the few fills I made up on the spot. FH: How often would you feel ... at the end of a recording date ... that you had created something magical? What was your original impression of this particular session? VF: Something magical, not too often. 'Gold Finger' with Shirley Bassey, 'Shout' with Lulu. 'It's Not Unusual' with Tom Jones, 'Trains And Boats And Planes' with Burt Bacharach to name only a few. But something good quite a few times. Impression of World Without Love was just a tuneful, folksy session. Nothing out of the ordinary. When I started hearing it all day and every day I knew something was happening. I still hear it today but mostly in Supermarkets. FH: "A World Without Love" went on to become an International #1 Record ... but, as I said earlier, Peter and Gordon were virtually unknown at the time. Certainly, having Paul McCartney write their first hit helped ... and the fact that Paul was dating Peter's sister generated a fair amount of publicity at the time ... but this was TRULY a GREAT record ... and, without question, these guys were very talented. What was it like working with them? They must have been pretty "green" in the studio. Of course, Peter went on to produce a number of HUGE hit records in the years to come ... but what were they like back then? Did you do any other sessions with them? Perform on any of their other hits? Do any tours or television appearances? VF: It wasn't as obvious as other recordings that World Without Love was going to be an International hit. They were 'green' in the sense of studio work but I remember them being well prepared which didn't happen too often back in the 60s. The EMI A&R team were throwing many artists against the wall and seeing who would stick so some of the singers who later became stars (or not!) were very unprepared and a bit awestruck with the studio scene. Before backing tracks became prevalent this meant quite a few takes! FH: We've concentrated mostly on Peter Asher here ... but most folks feel (Peter included!) that it was Gordon Waller who was the VOICE of the band. Certainly, we were all saddened to hear of his passing a few weeks ago. Any final thoughts or comments on Gordon? VF: To me, they were always Peter and Gordon. They had their separate characters, with Gordon being the more assured and outspoken and Peter sort of 'managing' in the back ground. I suppose that was a characteristic that led Peter to his position with Sony. I visited with them at their concert on Santa Monica Pier some time ago. Gordon looked tired and Peter's throat was bothering him but being always very professional, they did a great show. I was very saddened to learn of Gordon's passing. He was a real good guy and a great artist and entertainer. FH: Thanks, Vic ... I think this really helps to enhance the piece ... we just LOVE getting the "inside track" on some of these songs and artists! VF: Many thanks for the opportunity to say a few things about the duo. Keep up the good work. For some reason you did not give a mention to Bobby Rydell's version of A World Without Love, which was a top 20 hit in NYC. It is definitely done in over the top Rydell style but nevertheless is a good solid version of the song. It was on 7/29/66 that I picked up my very first WLS & WCFL surveys at some neighborhood TV & radio repair place. I had no idea that the decision I made that day would lead me down the path to where I am today. It would lead to the two of us meeting a dozen or so years later and it would begin a life long obsession with rock and roll music, radio & top 40 charts, that's still going strong as I just received a batch of WABC surveys in the mail today. 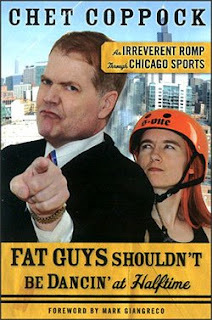 BIG NEWS: My book "Fat Guys Shouldn't Be Dancing At Half Time" hits the book stores September 10. It's a tongue in cheek, semi-biographical look at Chicago sports over the last 40 plus years. Take this to the bank. You may love the read or hate it. But I guarantee you it will make you laugh and think. I welcome all arguments. Just finished reading Bob Greene's 1993 book "All Summer Long." I got it after hearing you talk about how good it was. I think we should update your resume. Let's put Literary Expert next to Music Expert. This was another great book, just like all the other Bob Greene books I've read. I'm going to start reading Bob's latest book, "Late Edition, A Love Story." I'll send you my review when I'm finished reading it. "Philly Pop Music, The Lost Pioneers", profiles the extraordinary and diversified Philadelphia musical community with rare and unseen interviews, archive footage & photographs. "Philly Pop Music, The Lost Pioneers", profiles the extraordinary and diversified Philadelphia musical community with rare and unseen interviews, archive footage & photographs. A George Manney film. Todd Rundgren, Frank Stallone, Rufus Harley, Odean Pope, Laurie Anderson, Charlie Gracie, Phillie Phanatic, Skip Denenberg, and Philly Cheese Steaks! Thanks for the kindness, Kent, especially your review of My Dinner With Jimi, which, indeed, is available from Amazon and elsewhere. If any one has a hankering to know what life was like in a sixties rock band, give it a view -- the cast is super cool and guys like John Corbett and George Wendt add a screen cred that I certainly don't possess.As for our record, You Baby ... no, I don't sing along whenever I hear it on the radio, but I sing everyone else's songs ... you gotta be a fan of the music first ... then you can make your own. Thanks for keeping the home fires burning, sir. FIRST ... I do great compilations ... it's been suggested I do movie soundtracks ... I was listening to an older one today ... and several AL STEWART songs were included ... Not the 'hits' ... but several selections from a great, great album ... MODERN TIMES ... it's poetry! So cool to see Eric Carmen's "Make Me Lose Control" video ... always one of my favorite songs AND videos. I always told my ex-girlfriend P.M. Esther that I wish I had hair like Eric Carmen back then or John Lodge of the Moody Blues. She said that if I had hair like that, I'd be GAY!!! I don't think so ... especially after turning 60 years old, I'm just happy to have hair PERIOD!!! Thought you would be interested in this and please know that we will continue to actively pursue the crooks who are at the heart of it. Not like any of us is making anything anyway, but it just irritates the Hades out of me that bootlegging has even reached the New Colony Six. Feel free to beat on anybody’s head with me if you like, but please not Maryann Hutchison, who is the original eBay seller (this time – there have been others too, which surfaced through the diligence of Jerry Schollenberger. I figured this would all go away but now has only multiplied internationally – despicable!) but now has not only pulled her auction but is also helping me try to track down the criminals who are violating us and, I’m certain, fellow artists. Kent, feel free to pass the word; maybe if enough list members get up in arms and write these folks and the others who surely will surface, at least our rights, if not those of our sisters and brother in music, will be protected. It was recently brought to my attention that a bootleg / pirate CD was being sold on eBay, theoretically put out by Raven Records, an Aussie firm – but actually not by them at all. As a founding member of the New Colony Six and still fronting the band in our limited appearances each summer now since 1988, I know of the seven legitimate CD compilations that have been released on our music worldwide and this product is not among them. I investigated and corresponded with the eBay seller who agreed to remove it from sale and has done so. However, and this is where you fit into the picture, she went beyond that, giving me the name of the person from whom she purchased the CDs (see his name below and note that I have already tried to contact Walter by e-mail) and then also searching for other sellers of the same CD. In her search (look closer to the bottom of this transmittal), she pointed at you as another source for the CDs. (See the CD in question in the first note below) I want to get to the originating source of this and have distribution of the illegal product ceased and try to secure all unpaid royalties. If you are this source, I respectfully ask you to stop; if you are not, please tell me your source. You must know how artists are ripped off so I truly pray you are not involved, and hope you can help me get to the perpetrator(s) and stop them. Please respond so that I can continue my pursuit of justice relative to the release below and please help me stop its sale and preserve the integrity of our music and its distribution to the public. P.S. Failing to hear back from you in writing soon will lead to my presumption of your participation in this illegal activity and I will take any and all additional legal actions as can be taken. Should prove to be quite interesting. I've just posted my latest radio interview show, which I did with a singer - entertainer who has been at it for over 60 years! In the United States he had about 40 nationally-charted singles and 24 nationally-charted albums. And in 1972 he achieved additional fame by portraying a very well-known character (a singer) in a blockbuster motion picture. The man is Al Martino. He hit #1 with his very first released recording that came out on a tiny label based in Philadelphia: that was "Here In My Heart" and the label was B.B.S. Many people who started following pop music with the dawn of the rock era or later first became aware of Al when they heard "I Love You Because." That one made it to #3 on the chart and was the first of many, many more hits to come. What is amazing about Al, apart from his raw singing talent, is his versatility. "Here In My Heart" had a big band sound. "I Love You Because" had a country sound. Later on he even had a hit disco single with his version of "Volare" and sounded natural doing it! He assured me that he has no intention of retiring! Oh yes, there's that one other thing that I must mention before listing the tracks on this show. Al played the role of singer Johnny in the blockbuster Oscar-winning Best Picture from 1972 called "The Godfather." Who can forget that scene in which Marlon Brando gives Al a good tongue lashing and slaps him? Well, just in case you did forget, I'll remind you because I've included it in this show, along with Al's interesting comment about that particular scene. It really surprised me. Al is truly a winner and this show was one of the most special ones that I have ever done. Here's a sequential list of the recordings (plus the film audio clip) in this one hour show plus the two bonus tracks. All the recordings are by Al Martino. When that home page comes up, please click the "Ronnie Allen Theater" (the name has a yellow background) in the picture on the right-hand side. That will bring you to my index page. Please click on "Ronnie's Radio Page" and you will then be able to access the Al Martino (the first one listed under the blue heading "Current Radio Interview Shows") or any of my previous ones, which are listed in reverse chronological order. Just thought I'd pass this little article on. It really shows just how badly radio blew it with this generation. This article shows how my kids get their music suggestions. Just seems like a lot of work, though. One of the biggest business opportunities in America today is being largely ignored. Both of my kids are in the upper 20s to 30 age range. Both live in distant cities where Scott Shannon's True Oldies Channel can be heard, and both listen to it regularly. (Too bad the Nashville radio market is so messed up that no one will bring it here where Scott spent his best years) It's an interesting feeling when I hop in my daughter's soccer mom van and hear TOC when I turn the key. Trying to figure out how it's possible that True Oldies is playing Eddie Money's "Take Me Home Tonight" from 1986. Is it because the song features Ronnie Spector who had a career during the actual oldies era, and therefore the song passes as an oldie?? Another example: My wife was shopping in a retail store recently where a great mix of oldies was playing over the PA. She noticed the songs weren't the standard 200 worn down oldies, but included some lesser heard gems. At the checkout she remarked to the 18 year old clerk that she enjoyed the music they were playing. The young lady replied that she loved all the new music she was hearing while she worked and wished she could hear more of it. We've gone on and on with this topic on FH, so I won't add my own comments. These stories stand on their own. It's that time of year again. Time for the eleventh OldiesMusic.com Labor Day 500. (For anyone from outside America, Labor Day is a U.S. holiday that pays tribute to the average working man. It's the first Monday in September).We do it now every other year, so this is our first since 2007. Previous winners have included "Hey Jude," "Rock Around The Clock,""Satisfaction," "American Pie" and "In The Still Of The Night," though the Beatles' classic has won five of the eleven years. 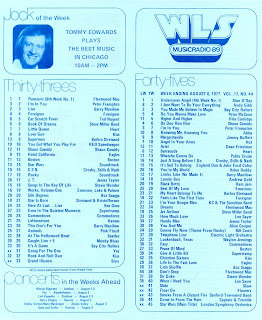 Participants are asked to vote for their ten favorite oldies singles in order from the decades of the '50s, '60s or '70s (songs must have made the Billboard Hot 100 chart or its predecessors though Oldies Music reserves the right to allow classic R&B tunes such as "Bo Diddley" to appear). Participants can only vote once. Anyone voting more than once will have all their ballots disqualified. The deadline for voting is Saturday,August 29 with the results available the following (Labor Day) weekend.Those who request it will receive a copy of the top 500 list when it comes out. To vote or see winners from past years (including some interesting trendanalyses), go to: http://www.oldiesmusic.com/500.htm. Joshing aside, that was pretty cool, bud. I'm an 'every Sunday' reader and can't find the words to properly express my thanks for all you do to put this together for us. I read EVERY word ... EVERY day ... NEVER miss an issue ... have LOVED what you do for the past eight or nine years now (no, I'm not one of the infamous "First 35" ... but I joined the list pretty early on!) I wish you could have found a way to earn a living and make a career out of what you do ... your passion shines through in every word you write ... and you deserve recognition for all you've done to keep this music alive. Please don't ever stop writing Forgotten Hits ... pace yourself if you need to ... but we look forward to everything you send. Here's to another ten years!